First, CEFs pay an outsized income stream—7% yields are easy to get and easy to sustain with a CEF portfolio. Second, CEFs often trade for less than their intrinsic worth. 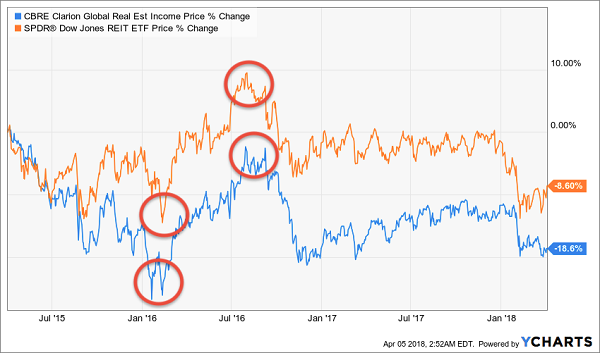 While ETFs trade at their net asset value (NAV, or the liquidation value of the assets in their portfolios), CEFs can trade for 10% less … or even more. That can set you up for nice 20%+ upside on top of those 7%+ dividends. And finally, if not most importantly, a bunch of CEFs have crushed the S&P 500 for years. Maybe this is why the fast-growing ETF industry doesn’t want investors to even know CEFs exist. 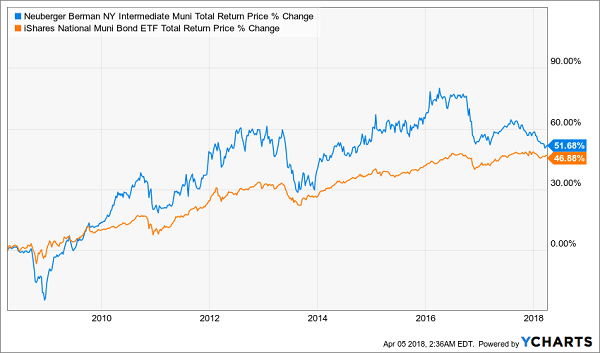 It’s also why I’m passionate about getting the word out, because there are a lot of opportunities for income investors to get a high yield and market-beating returns, something you just won’t fund in “dumb” index funds. I regularly comb a universe of 500 CEFs to see when indicators point to “buy,” and thanks to the recent volatility in stocks, ETFs and just about everything else, there have been a lot of CEFs with a lot of buy indicators. So today, I’m going to show you 4 funds on our just-updated CEF Insider Watch List that every investor should take a close look at—and why they’re so enticing right now. 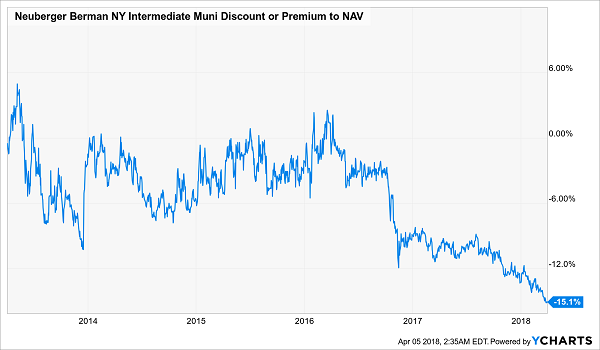 Let’s start with some tax-free 4.5% dividends courtesy of the Neuberger Berman NY Intermediate Municipal Income Fund (NBO). Thanks to a tax code that does not include municipal bond income as taxable income, most US investors who buy NBO will keep 100% of the income they get, without having to pay taxes on it. For Americans in the highest tax bracket, that 4.5% dividend is the same as a 7.5% from dividend-paying stocks or corporate bonds. And that’s just the first reason why I like NBO now. The second is that it’s suddenly cheap. 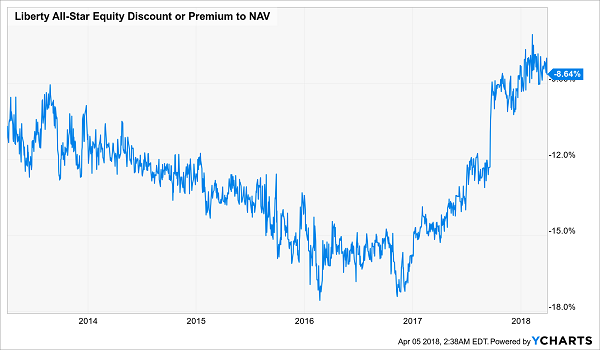 The market has sold off this fund, although its NAV has held up well, which is why its 15.1% discount to NAV is the widest it’s been in years. With an income stream twice that of MUB and outperformance, too, NBO is worth your consideration at any time. Its huge discount makes it an even better bet. 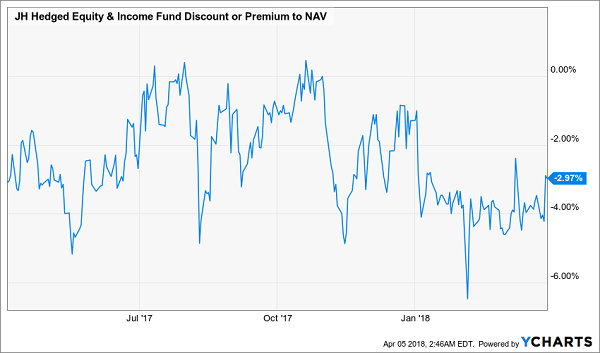 The Liberty All-Star Equity Fund (USA) has seen its discount to NAV get narrower and narrower in recent months. That’s just part of the story. USA also increased its dividend by 38.5% in the middle of 2017, right when the stock market’s bull run was at its strongest. That prompted investors to bid up USA, causing its big discount to diminish. I expect this trend to continue through 2018, so you can expect capital gains with USA as the discount dwindles. And you’ll get an amazing 11.7% dividend yield while that happens. That’s not the only good thing about USA, though. It’s full of high-quality companies that are in the doghouse: names such as Amazon (AMZN), Alphabet (GOOGL) and Bank of America (BAC). Recent market fears have brought these stocks down, even though their earnings are rising. I expect the market to realize its mistake when these companies post blowout second-quarter earnings—and all signs suggest that’s inevitable. That means buying these stocks now is smart, but buying them at a discount is smarter. That’s what you get with USA. If you’re too nervous about market volatility to buy a stock fund, consider getting defensive with the John Hancock Hedged Equity & Income Fund (HEQ). HEQ is appealing because it bets both on and against the market to keep its price from swinging too much by buying high-quality stocks and short selling low-quality firms. That strategy has been a blessing for nervous investors in 2018. When volatility in the S&P 500 soared, HEQ’s volatility stayed nice and low. But HEQ isn’t just a place to park money; it’s a strong income producer, using its bets on and against stocks to generate a 9.3% dividend. And with a 3% discount to NAV, HEQ trades at an unusual markdown that’s worth paying attention to. Investors who buy now and hold will get a big income stream, some stock-market exposure and the opportunity for a bit of capital gains as investors look to escape volatility, which is becoming the big theme for 2018. 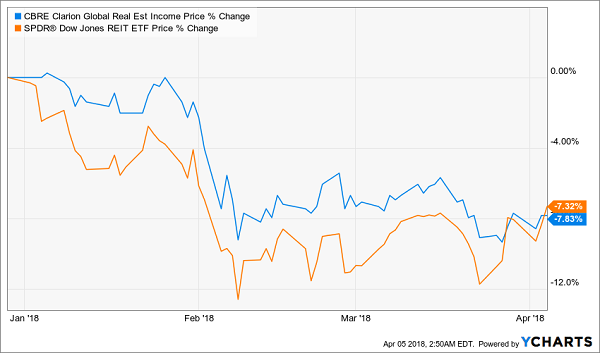 My next pick may surprise you, especially if you’ve been following real estate investment trusts (REITs): the CBRE Clarion Global Real Estate Income Fund (IGR). 2018 has been brutal for REITs. For the first quarter of the year, they fell 7%, and the market was a bit harder on IGR. But price cycles in REITs are often like this; they’ll crash hard for a few months when investors panic over interest rate hikes—then they’ll realize they’ve oversold, resulting in a huge rebound. That’s exactly how this movie played out in 2016—for both the SPDR Down Jones REIT ETF (RWR) and IGR. Notice the trough-to-peak moves in both IGR and RWR, resulting in around 20% gains within just 6 months? 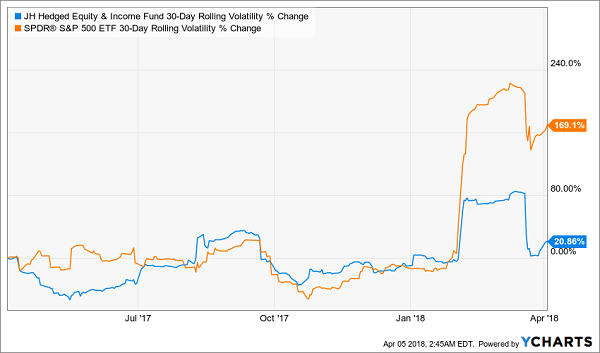 That fast price movement happened because investors oversold after the Fed raised rates in late 2015, then realized their mistake while the Fed was still raising rates in 2016. That dynamic is identical to what’s happening in 2018. As a result, we can buy IGR today at a 13% discount to NAV and get its 8.2% income stream while waiting for that 20% capital gains jump. No one knows when it will happen, of course, but if history is any guide, it will be later this year or in early 2019 at the latest. This past Sunday, I released my 5 hottest CEF picks—and I want to show them to you now! They have a lot in common with the 4 funds we just discussed, but with one crucial difference: they’re not on my WATCH list now … they’re the top 5 names on my personal BUY list now. Each of these funds does something no ETF or common stock can (at least without forcing you to heart-stopping risks). These 5 unsung CEFs throw off safe, and massive, dividend payouts—I’m talking an average 8.2% in CASH, with one of these beauties even handing you an outsized 10%! 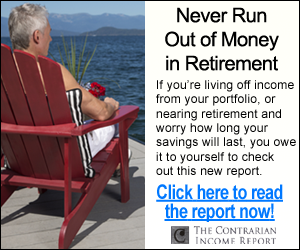 Imagine what that would do for your retirement portfolio. Because each and every one of these payouts is SAFE. And thanks to these funds’ massive discounts to NAV, we’re looking at a nice 20% price gain in the next 12 months, on top of that life-changing income stream! To put that in dollars and cents, putting $400,000 into these funds today would immediately kick-start a $32,800 yearly cash stream. PLUS you’d be set up for a nice $80,000 in upside too. And because you’re getting most of your return in CASH, you’ve got some nice insulation from volatility here too. 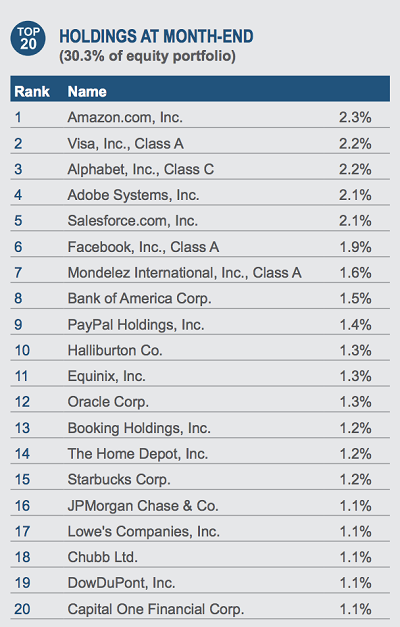 Funny thing is, you won’t hear a whisper about these obscure wealth builders from Wall Street. They’d much rather steer you into an ETF, like the SPDR S&P 500 ETF (SPY), an “automatic” fund that simply tracks the benchmark index. It’s a lot easier for them, because they don’t have to do a smidgen of research, and they get paid anyway. That’s great for them, but terrible for you. Because if you follow their “advice,” you’ll be stuck “grinding it out” on the pathetic 1.9% SPY dribbles out today. And you’re still exposed to the stomach-churning market swings we’ve seen since the beginning of 2018. 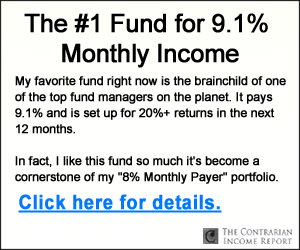 That’s no way to fund your retirement, and it’s exactly why I rolled out these 5 incredible 8.2% paying CEFs now. I can’t wait to show them to you. All you have to do is CLICK HERE to get instant access to the name, ticker symbol, buy-under price and my complete research on each of these 5 cash machines!